Oud/Aoud/Oodh/Agarwood is a ‘dark, resinous heartwood that forms in Aquilara and Gyrinops trees when they become infected with a type of mold.’  The smell of Oud really varies and from my experience it can smell medicinal, animalic and funky like a barnyard or intensely peppery and spiky. Over the last couple of years there has been a plethora of fragrances released based around oud, a note which has been used in middle eastern perfumery for thousands of years. Oud has very much become the note du jour and it seems that almost every fragrance house has done ‘an oud’. One house that kicked off the trend is Montale, created by perfumer Pierre Montale and tucked away in a corner of the very upmarket and glamourous Place Vendôme in Paris, Montale focuses on rich oriental fragrances and exotic blends using the famous oud. 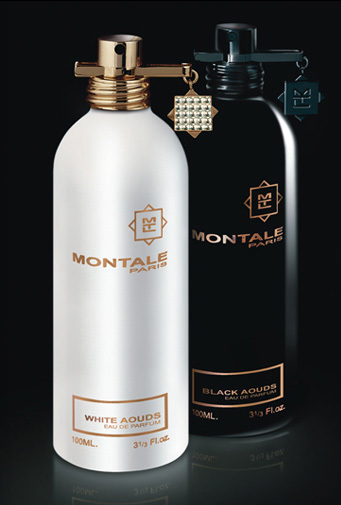 This review is of two of Montale’s most well known scents, Black Aoud and White Aoud. These two scents strike an interesting contrast with each other and show the versatility of the oud note. 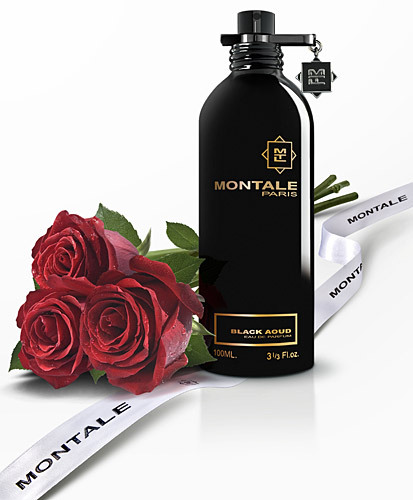 Black Aoud was released by Montale in 2006 and it’s highly regarded in the perfume community as one of the best Oud scents available. It is mainly a blend of Oud, Rose and Patchouli in the grand middle eastern style. Black Aoud opens with a big blast of super-potent oud which is at once both sour and medicinal. If you don’t like oud then you definitely won’t like Black Aoud, it’s chock full of the stuff and it stays strong all the way through to the dry down. The beginning of Black Aoud very much feels like the start of a concert, the notes seems to mill around trying to find their seats and once they do the real magic starts. The heart of Black Aoud is the blend of oud and rose, a blend that is fairly common in middle eastern perfumery but was less familiar in western perfumery at the time of Black Aoud’s release. This rose is dark and heavy, it doesn’t have any of the fresh brightness seen in most mainstream releases. Black Aoud is incredibly dense and thick, the notes take a long time to develop and for the first couple of hours they are hidden behind the intense oud. As it dries down, Black Aoud softens to a blend of powdery, peppery rose and dirty patchouli which lasts well in to the next day without relenting. In the dry down the rose has a beautiful sweetness that seems like a stark contrast to the darkness that proceeds it. I would recommend Black Aoud to those who enjoy thick, heavy rose perfumes. It has that old, dusty quality to it that makes me think of old antiques shops and flea markets. White Aoud is a very unusual take on the oud note, it’s a warm, creamy and cosy oud that seems soft and fuzzy. It is by far one of my favourite Oud scents and smells vastly different from a lot of the other Oud scents on the market. Where Black Aoud is all about Oud and Rose, White Aoud is all about Oud and Vanilla. It opens with the signature Montale oud, still medicinal but not as harshly so as Black Aoud. The vanilla comes through very quickly, and it’s more dry than gourmand. The whole composition is lightened by a sprinkle of zingy saffron. There is rose in White Aoud, however it is used with a light touch and it contributes to the brightness of the fragrances. The rose here is far from the dark, brooding rose used in Black Aoud. The base is where the beauty really lies, after all of the other notes have died down you are left with a perfect blend of rich oud, vanilla and creamy, slightly fuzzy sandalwood. White Aoud lasts a long time and the base lingers for days. Up close, White Aoud does smell slightly harsh and medicinal but the silage it projects is absolutely wonderful. When I wear White Aoud I am engulfed in a cloud of warm vanilla, oud and sandalwood and in the winter there is nothing better. White Aoud is a comfortable and easy to wear oud and would be a great starting point for those who are just starting out on their oud journey of discovery. White Aoud and Black Aoud are both available in 100ml and 50ml eau de parfum and can be purchased from the Montale boutique or online at Luckyscent. 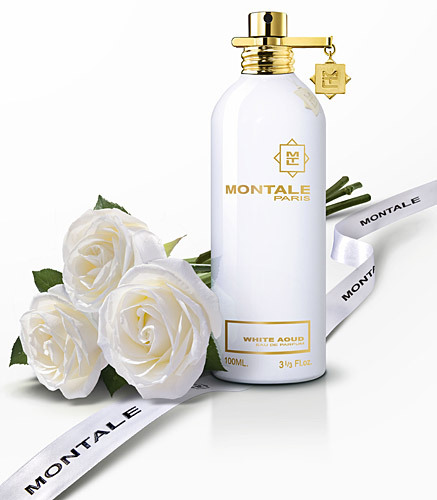 Unfortunately, it is nigh on impossible to purchase any of the Montale line within the UK and the only way to get hold of them is to order directly from the Paris boutique. Have you tried either White Aoud or Black Aoud? What’s your favourite Oud fragrance? This review is based on bottles of Black Aoud and White Aoud purchased by myself. Posted in Floral, Montale, Oriental, Oud, Perfume Reviews, Unisex and tagged 2006 Release, Agarwood, Black Aoud, Montale, Oodh, Oriental, Oud, Paris, Unisex, White Aoud. Bookmark the permalink. Hmm, I’m not sure I ever tried White Oud but even though I like oud as a note, Black Oud is still a bit too much for me. I don’t know if I have a favourite oud fragrance, but only yesterday I sampled Wild oud by Montale and I’d say that’s a serious contender. Black Aoud definitely can be a bit too much, I really have to be in the mood to wear it. I’ve not tried Wild Aoud, but I’ve heard good things about it, I shall have to seek it out. You are very lucky to have Montale! I had to go all the way to Paris for my bottles 😦 (not that I minded spending 4 days in Paris of course 😛 ). I tried Armani Prive Oud Royal a few months back. Whilst it didn’t grab me at first, it aroused curiosity. Subsequent visits have left me wanting it. The medicinal, sour, sharpness is right up my street. That White Aoud sounds great too, I like the sound of what vanilla and oudh would do together. Reading the notes of Armani Prive Oud Royale makes me think it may be worth a try. Isn’t it ridiculously expensive? Sheesh! But worth it if you love it! Very interesting reviews though and I am quite tempted to try White Oud (the line is available here, so if you ever need anything let me know!). White Aoud is definitely my favourite of the two, it’s more of an ‘oud with training wheels’ so you may find it a good place to start with the line. I may take you up on your offer if I need any more Montale scents. Have you tried any oud fragrances that you really dislike or is it a bit of a ‘take or leave it’ note for you? I have quite a stock pile of Montale fragrances and the ours are among my favorites. I remember trying White Aoud and being knocked out by the genius of pairing our and vanilla. They resonate so well together. Black Aoud is just rosey, oudy perfection. Montale was the gateway drug for me to reach out and explore the world of Middle Eastern perfumery. Black Aoud is lovely, if not a little too heavy. I find that I need to be in the mood for BA but could wear WA anytime, it’s just so delicious. I’ve not tried many Montale scents (there are so many, it’s almost overwhelming). Aoud Lime is nice and I’ve heard good things about Red Aoud.